I was approved for FEMA assistance. What can I use the money for? The money can be used for a temporary place to stay, making repairs to make your home safe, sanitary and functional, and replacing or fixing essential household items like appliances and clothes. Visit our page on disaster assistance available from FEMA for more information. How can I find a temporary place to stay? Visit the South Carolina Housing Search page to find rental properties in your area. You can also search the FEMA Housing Portal. How do I discuss my temporary housing options further? Please call 800-621-3362 or visit your closest recovery center by using the Disaster Recovery Center locator to find a location where you can speak with someone face-to-face. How do I extend receiving rental assistance? You should expect a letter from FEMA within two weeks of receiving your first rental assistance award. The letter details what you need to submit if you want FEMA to continue assisting you with temporary housing assistance. You will need to submit: a completed form that came with the continued temporary housing assistance letter, a copy of your lease, receipts showing proper use of previous rental assistance, current household income status and any household financial obligations. It’s important that you keep your contact information current so you’ll receive the letter. You can update information online at disasterassistance.gov or by calling FEMA’s helpline at 800-621-3362 or TTY 800-462-7585. GRAPHIC: "What To Do If You Disagree With FEMA's Decision Letter"
I applied with FEMA and was given a letter saying I’m ineligible or that my application was incomplete. Does this mean I’m not going to get any help? Do not be alarmed or discouraged. It may simply mean that FEMA does not have all the information needed to make a decision regarding your application for disaster assistance. It’s important to call 800-621-3362 or visit a recovery center to discuss this with us face-to-face. 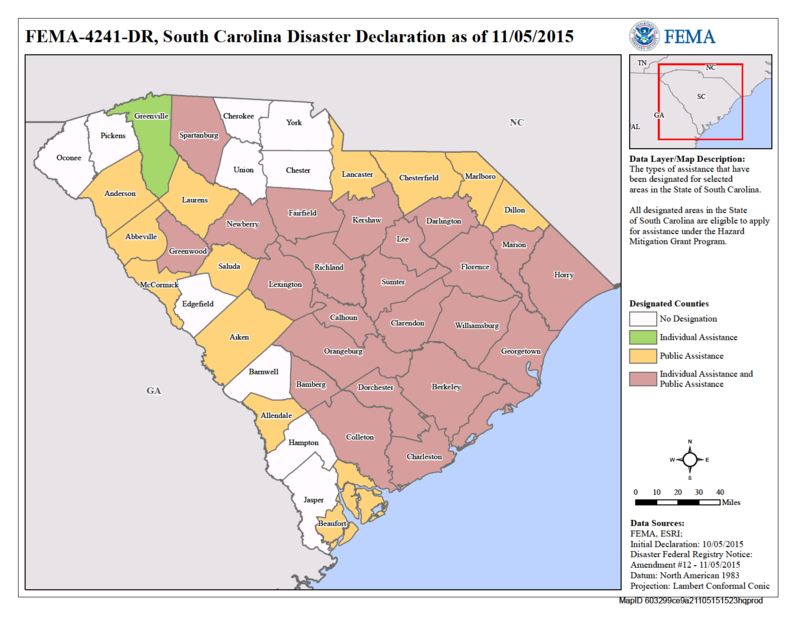 Find your closest South Carolina recovery center by using our Disaster Recovery Center Locator. Can I appeal my determination letter? Every applicant has the right to appeal. Appeals must be delivered within 60 days of the date on your determination letter. Guidelines for appeals can be found in the Applicant’s Handbook sent to everyone who registered with FEMA. You can visit our page I Want To Have My Case Reviewed Again for information about how to appeal. You can also call 800-621-3362 or visit your closest South Carolina recovery center to speak with somebody who will assist you through the appeal process. What are some reasons why I could have received this letter? Maybe you didn’t return information about your insurance policy, provide information to prove occupancy or ownership of the damaged property, fill out all necessary paperwork, or complete and return the U.S. Small Business Administration disaster loan application. You are not obligated to accept an SBA loan offer. I have insurance. How do I get that information to FEMA so you can proceed with my application? How long do I have to submit insurance information? You have up to 12 months from the date you registered with FEMA to submit insurance information for review. FEMA cannot provide money to individuals or households for losses already covered by insurance. I lost my insurance information in the flood. How do I contact them? The South Carolina Department of Insurance has contact information for your insurance companies and additional information about insurance claims. South Carolina Emergency Management has many resources in how you can help including a list of charities and requested items for donation. How do I get assistance to purchase food? Visit the South Carolina Department of Social Services site for more information and a list of locations to apply for assistance under the Disaster Supplement Nutrition Program (DSNAP). Where can I find other forms of assistance to help my recovery? Visit SC211.org to find help in your area that may be able to assist you. Don’t give out credit card of bank information. For more information, contact the South Carolina Department of Consumer Affairs’ ID Theft Unit for more tips on dealing with identify theft and scams at 800-922-1594 or www.consumer.sc.gov. FEMA can assist with reburial expenses for coffins that were forced from graves if the grave was in a family burial plot or a privately owned cemetery not operating as a licensed cemetery. The person who incurred the expenses must register for FEMA assistance to request help. For more information call 800-621-3362. People who are deaf, hard of hearing or have speech disabilities should call 800-462-7585 (TTY); those who use 711/VRS may call 800-621-3362. The best way to donate help is to make a monetary contribution to one of the many Voluntary Organizations Active in Disaster. Charitable agencies are listed on South Carolina’s Emergency Management Division’s website: scemd.org. The U.S. Secretary of Agriculture’s disaster declaration makes all qualified farm operators in the 29 designated and 13 contiguous counties eligible for low-interest emergency loans from the U.S. Department of Agriculture’s Farm Service Agency. FSA has other programs that can provide assistance, but do not require a disaster declaration. To learn more, visit //disaster.fsa.usda.gov. Farmers and ranchers may also visit DisasterAssistance.gov for information about assistance. The U.S. Small Business Administration’s Economic Injury Disaster Loan program is available to eligible farm-related and nonfarm-related entities that suffered financial losses. With the exception of aquaculture enterprises, SBA cannot provide disaster loans to agricultural producers, farmers or ranchers. For more information, visit https://www.sba.gov/offices/disaster/dfoce/resources/1495740. The National Flood Insurance Program call center serves and supports policyholders. Call 800-621-3362 (press 2 for NFIP). Hotline hours: 7 a.m. to 10 p.m. daily. Substantial damage inspections and decisions occur at the local level based on local criteria and ordinances. Property owners with questions or concerns about substantial damage should direct their inquiries to their local officials.